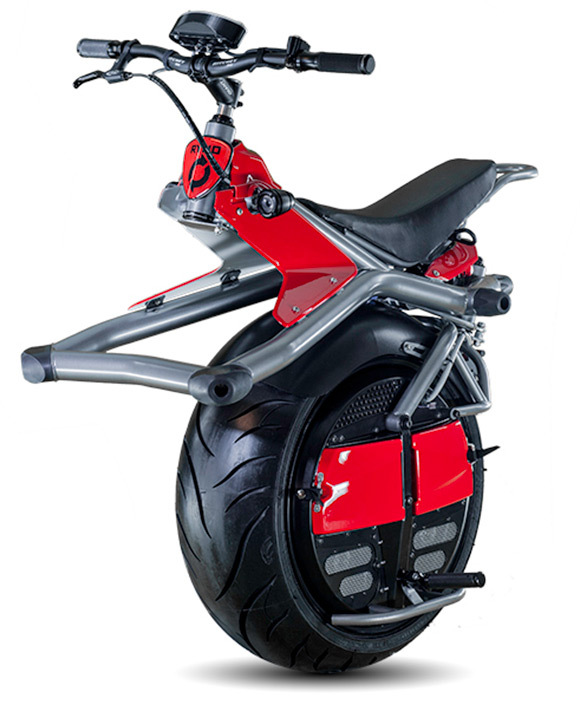 If the rampant use of the overpriced Segway was not enough to shake rotund members of western society into exercising practices (that includes actually walking on two legs when you are able), there is now a bastardization out there with one wheel: the RYNO. How does a $5300 (starting price) sound for a RYNO? That is competitive with Segway pricing, but you have the benefit of sitting down, instead of standing like a silly looking tourist would while on a Segway traversing the myriad crosstown sights in Washington D.C.
Look closely at the RYNO: you will notice a cheap mountain-bike handlebar, a dirt bike seat and upper chassis, and a chopper or modern Harley Davidson-like 240-millimeter-wide motorcycle tire. For the price of a used Harley (that gets great urban fuel mileage), the RYNO offers you an off balance of features, a top speed of ten miles per hour, and a horsepower rating of five. But not take my word on this, folks. Gizmodo loved this little RYNO.